Coming into this spring, Yusmeiro Petit didn’t have a roster spot locked down with the Giants. David Huff was ready to be the long man, and he started the spring off better than Petit. Manager Bruce Bochy showed confidence in his righty and eventually the team made what looks to be the right decision. 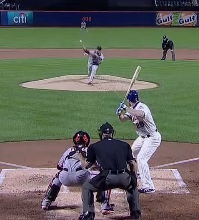 Though only a little has changed about Petit since his early days in terms of his fastball command and four-seam/curve/change arsenal, perhaps Bochy saw what the hitters weren’t seeing so well: Petit has an invisiball. When you find a pitcher like this — he’s been waived once and released twice — there are usually a few things that have to come together. For one, you probably have to make some changes. And the Giants did, with Dave Righetti improving Petit’s curveball. Though he’d always had the pitch, under the Giants’ tutelage, he firmed up the curve. It now goes two miles per hour faster and has two inches less drop than it used to, which makes it look a bit like a big slider. 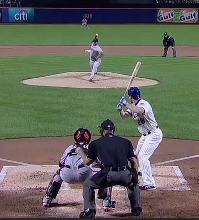 And now it has the best whiff rate on any starter’s curveball in baseball. That might be because it’s a slider. Petit admitted Sunday night after the Giants’ game five victory that Righetti didn’t change the grip on his curveball. He changed the shape of it. Now Petit comes over the top and drags down a little more for a 12-to-6 curve against lefties, and comes around the side a little more for his frisbee curve against righties. Yeah, he admitted, it’s sort of a slider. Check out what looks like two different breaking pitches that are called curves by PITCHf/x algorithm below. 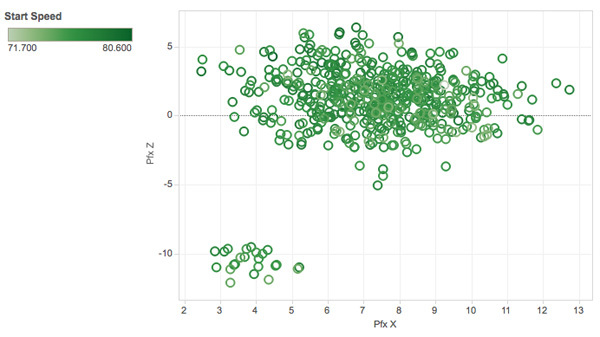 On the scatter plot, you’ll see the x- and y- movement, and the color of the bubbles represents their velocity. In order to find a Petit, you probably also have to value a skill that’s not always the first thing scouts look for. Petit’s fastball still has difficulty cracking 90, but he has plus-plus control and some ride to his fastball. Not one of his pitches has a ball rate over 35% for his career. Phil Hughes had the best walk rate in baseball this year. He had two pitches with a ball rate over 35%. Petit also gets an inch more rise on his fastball than average, an aspect that’s related positively to more infield fly ball rates — his 4.8% pop-up rate is well above the 3.7% league average for his career. And then you also have to look for things that other people don’t see. Except that’s not totally fair. Some people did say that Petit’s delivery could be to his advantage. Jeffrey Paternostro on Amazin Avenue wrote up Petit in 2011, and a few key words can serve as harbingers. The “unorthodox motion that Petit used to befuddle minor league bats” might have just been a “funky delivery” that wouldn’t work against majors, or maybe there was something more there. After all, Paternostro pointed to one great quote from Baseball America on Petit that now rings very true. Ask around the clubhouse, and they know there’s something different about his delivery. Javier Lopez agreed the pitcher “has that deception and kind of jumps at the plate.” Tim Hudson said the arm motion is a little different, but every pitch comes out of the same spot. There’s agreement he has deception; how that deception is achieved was still a mystery. What happened to the ball? His elbow happened. Sure, Petit doesn’t have much velocity. The Giants focused on what he did have — fastball command and a good change. And the coaching staff worked on what Petit didn’t have by improving his curve. But it was also what batters couldn’t see that ended up making Petit what we see today. We hoped you liked reading Yusmeiro Petit’s Invisiball by Eno Sarris!